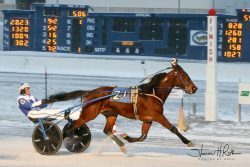 Hamburg, NY – Time Will Tell All and HP Sissy each used different methods to find their way to the winner’s circle in Buffalo Raceway’s co-featured events on Wednesday night (Feb. 13). Time Will Tell All used a late charge down the passing lane to take the victory in the $10,500 Class A Open Handicap Trot, while HP Sissy made every step a winning one to capture the $10,500 Class A Open Handicap Pace for the filly and mares. Time Will Tell All scores in the Class A Open Handicap Trot for Shawn Grey. Photo by Steve Roth. Driver Shawn Gray got a perfect pocket trip in the opener with Time Will Tell All and never took the lead until the shadow of the wire. After drafting behind the front stepping Chelseas Chance, who posted splits of :30.2, 1:00.4 and 1:32.0, Time Will Tell All ($7.70) had a spot through the passing lane and held back a late rally from Lucky Guess (Drew Monti). The winner tripped the timer in 2:02.3, notching a neck decision. A game Empire Earl N (Billy Davis Jr.), a winner of three straight, finished third while being parked the entire mile. Owned by William Emmons and conditioned by James Clouser Jr., it was the first victory in four tries in 2019 for Time Will Tell All (Prayer I Am-Tender Dion). The win pushed the 8-year-old gelding’s seasonal earnings to $8,125 and $200,036 lifetime. HP Sissy took command off the gate and held on late to score a $16.40 surprise in the co-feature for the distaff pacers. Denny Bucceri guided HP Sissy right to the lead, posting fractions of :28.4, 1:00.0 and 1:29.4. Things got a little scary for HP Sissy in deep stretch as You Mach Me Crazy (Gray) was full out but saw her threat come up just a neck short. Sentimental Lady (Ray Fisher Jr.) took the show position. HP Sissy wins the Class A Filly and Mare Open Pace. Photo by Steve Roth. Trained by Mike Ohol and owned by John and Sally Finocchario, it was the second victory in four outings for 6-year-old mare HP Sissy (Up The Credit-Monica Blue Chip). The win upped her seasonal earnings to $10,263 and $261,399 in her career. Gray completed the evening with five victories in the bike with Fisher Jr. and John Cummings Jr. each getting a double. Racing will continue on Saturday evening (Feb. 16) at 6 p.m. with a 13-race card scheduled. 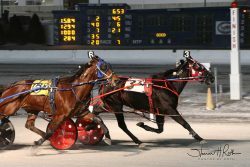 For more information including the latest news, race replays, entries, results, upcoming promotions and simulcast schedule, go to www.buffaloraceway.com.